← Thank You For the Scathing Review? Posted on April 9, 2014 by R.T.
Do you like detective/mystery romance? The Nickie Savage Series is one to try. Increase your chances of winning by leaving comments on the blogs. 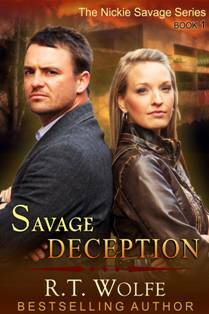 This entry was posted in Nickie Savage Series, Savage Deception and tagged Artist, best seller, best selling, Detective, Murder, Mystery, R.T. Wolfe, Romance, Romantic Suspense, Suspense. Bookmark the permalink.